The word memorandum (memo for short) comes from the Latin memorandum est – “It must be remembered”. I like the word memorandum. It’s an old fashioned way of describing a company announcement or update. But it’s Latin meaning – it must be remembered – is also a great way to think about internal content. These days, a lot of companies send out memorandums via email. But the more organised ones do something different – they build an internal blog. Blogs are easy to refer back to. You don’t have to go trawling through a thousand emails to find the memo you need. In a blog, everything is neatly organised. In other words, you’ve got no excuse for losing or forgetting memos – you must remember it. What does an internal blog look like? How do I write a company blog? How do I come up with ideas for my company blog? A company blog is a place for an organisation to share news with their employees. This could include milestone, customer testimonials, new starters, new offices and much more. Basically, it’s a place to share anything you want your employees to know. It is not a dumping ground for information. It’s a place to tell your story – a reminder to your staff about why they work for you, and not your competitor. What you write about is entirely dependent on how big your organisation is. For example, writing a blog post announcing someone’s retirement works well when you’ve got 50 staff. But when you’ve got 500 – not so much. Now that last point might sound a bit tricky. Basically, what it means is that you have to match your tone to your organisation. 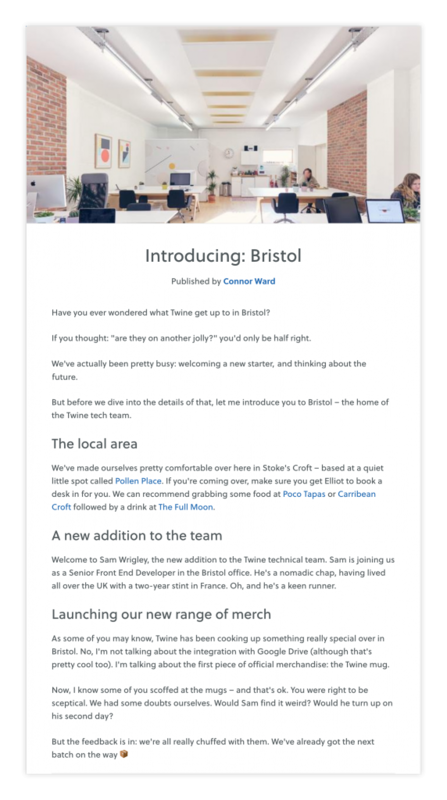 For example, if you’re a small startup like us at Twine you can get away with (quite) a few jokes. But, say you’re at a 300+ strong law firm – you’ll have to save the lampooning of your balding boss for a private occasion. When it comes to images, I always recommend you use your own photos rather than stock photos: shots of your actual team, office and products are always better than a cheesy stock photo. For example, compare the images below. The one on the left was the easiest to find (it was the first image that came up when I typed in ‘stock photo office’). The one on the right took a bit more effort because we had to actually take a photo of our office. Which would you rather read? The goal of this article was to give you some ideas and inspiration for when creating your own internal blog. You’ll have noticed that all the screenshots above feature the same app: Twine. It’s an application designed to specifically to help companies master their internal comms. We use it ourselves and, when it comes to internal blogging, I think it does a bang-up job.